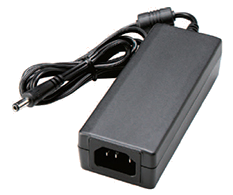 The DTEPU40 series of AC DC desktop power supplies offers up to 40 watts of output power in a 4.2” x 1.85” x 1.19” package. This series offers single output models with output voltages ranging from 5~48VDC and a wide input voltage range of 90~264VAC. Each model is both Energy Efficiency Level VI and RoHS compliant and has high efficiency of 84~90%.. Each model is also protected against over current conditions and has UL/c-UL (UL 60950-1:2nd Edition) and TUV/GS (EN60950-1:2nd Edition safety approvals. 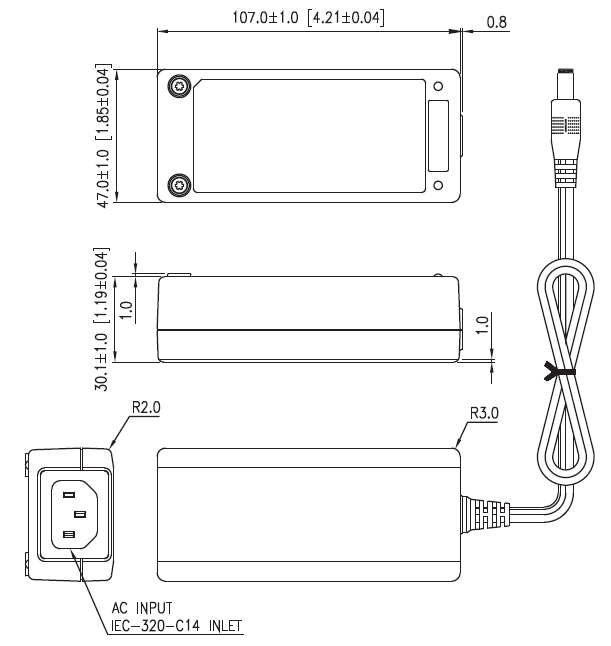 Dimensions: 4.21" x 1.85" x 1.19"
Notes: (1) DTEPU40A-102-104 are required to use AWG#14/4FT output cable. DTEPU40A-105-110 are required to use AWG#18/4FT output cable. DTEPU40A-111 is required to use AWG#20/4FT output cable. The electrical characteristics will be changed by modified output cable. (3) Output can provide up to peak load when the power supply starts up. Staying in more than rated load continuously is not allowed. (4) Each output is checked to be within voltage accuracy in 60% rated load condition. (5) Line regulation is defined by changing ±10% of input voltage from nominal line at rated load. (6) Load regulation is defined by changing ±40% of measured output load from 60% rated load. (7) Ripple & Noise is measured by using 20MHz bandwidth limited oscilloscope and terminated each output with a 0.47uF capacitor at rated load and nominal line. (8) Hold up time is measured from end of the last charging pulse to the time which the main output drops down to low limit of main output at rated load and nominal line. (9) Efficiency measured at rated load and nominal line.